Malaria is an infectious disease caused by a parasite: it is spread by the bite of an infected mosquito. People catch malaria when the parasite enters the blood. The parasite causes a deadly infection which kills many people each year. The parasite that causes malaria is a protozoan called Plasmodium. Protozoa are organisms with only one cell, but they are not bacteria. Bacteria are smaller and simpler than protozoa. People usually get malaria from the Anopheles or Culex mosquitoes: they are the vectors of the disease. The Plasmodium gets into people by the bites of mosquitoes. The Plasmodium is in the mosquito's special saliva. The mosquito's saliva injects an anticoagulant into the person to prevent their blood from clotting. The person is then infected with Plasmodium as a by-product. This makes the person have the disease we call malaria. Only the female mosquito gives people malaria, because only the female mosquito consumes blood. The male mosquito lives on the nectar of flowers. The female uses blood as a source of protein for its eggs. Some people do not get malaria from mosquitoes. A baby can get it while inside its mother. This is called maternal-foetal transmission. People can also get malaria from a blood transfusion. This is when someone gives blood to another person. Another way people can catch malaria is by using a needle that someone with the disease used before them. Malaria life cycle In humans, after being bitten by an infected mosquito the malaria parasites first infects the liver. At this stage their are no symptoms. The red blood cells are infected next, at this stage symptoms of malaria appear. When an uninfected mosquito bites an infected human they become infected and continue the cycle. Malaria infected red blood cellColorized electron micrograph of red blood cell infected with malaria parasites (blue). P. vivax and P. falciparum cause the most malaria in people. Falciparum malaria is the worst kind, and kills the most people. When Plasmodium enters the blood, they are then called sporozoites. Sporozoites go to the liver, where they make many more sporozoites. Then they change into a different form of Plasmodium. This form is the merozoite. The merozoites go into the red blood cells, then they make many more merozoites. The merozoites break out of the red blood cells again and again. When they do this, the person gets very sick, and shows symptoms of malaria. This happens every few days, and is called a paroxysm. P. vivax and P. ovale can live in the liver for a long time. A person can look well, but still have the Plasmodium in the liver. This is called a dormant phase. Weeks or months later, the Plasmodium can leave the liver to the blood, and the person will get sick again. P. falciparum is the most dangerous type of malaria. It makes people sicker than those with other types of malaria, because there are more of them in the blood. Also, with falciparum malaria, the red blood cells are sticky. This makes the red blood cells block blood vessels. If blood vessels are blocked, this can hurt what the blood vessel brings blood to, and can hurt people's organs. Pregnant women and children are hurt most by malaria. When they get malaria, they get sicker. Every year, 300 to 700 million people get malaria. It kills 1 million to 2 million people every year. 90% of the deaths occur in Africa. Most of the people who die from malaria are children. Even if children do not die, many have brain damage. Many of these deaths might be stopped with medicine or mosquito control. But many of the places malaria may be found are in poor countries. These countries do not have enough money to stop the mosquitoes, or to give people medicine. Money, however, is not the only problem. A country must have an organised medical system to provide services. Many countries in central Africa have been disrupted by warfare and conflict between groups, and general unrest. Also, easy solutions to kill the parasites do not exist as they did 50 years ago. This is because the insects are resistant to many insecticides, and the Plasmodium parasite is highly resistant to quinine and most other common drugs. This is a normal evolutionary process: the chemicals weed out the non-resistant organisms, and the offspring of the few resistant organisms multiply. 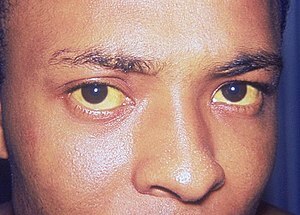 JaundiceMalaria can cause jaundice, which causes the skin and the white areas of the eyes (sclerae) to turn orange-yellow. This is caused by hyperbilirubinemia - too much bilirubin in the blood. Bilirubin is a pigment which results when the body breaks down old red blood cells. Symptoms are changes in someone's body that are signs for a disease. Most people who get malaria get symptoms 10–30 days after they get infected (the Plasmodium gets in their blood.) But some people can get symptoms after only a week, and some may be infected with malaria and not have symptoms for a year. The most common symptom of malaria is fever, when the body temperature is high. The fever from malaria usually comes very suddenly. The people who have Malaria often feel like they had influenza. Enlarged organs. When something becomes enlarged or BIGGER than normal the word often ends in -megaly. Hepatomegaly -enlarged liver, splenomegaly - enlarged spleen, or both hepatosplenomaegaly. When these organs become enlarged it may cause pain in the right upper quadrant of the abdomen. Complications are problems that happen because of a disease. Pregnant women and young children have more complications. People who get malaria for the first time have more complications. Falciparum malaria has the most complications. P. falciparum in the blood. If no treatment is given, death often occurs. Even if treatment is given, 15%-20% of people with it die. Many red blood cells break open and the hemoglobin in the cells gets into the blood. This hemoglobin is put in the urine and makes it look very dark. Without the right care this can make the kidneys stop working. This is fluid in the lungs that makes it hard to breathe. Pregnant women get this much more. 80% of people who get this complication die. Children and pregnant women get this more. This can cause people to look like they are drunk or to be in a coma. This means breakdown of red blood cells. It can cause blackwater fever, jaundice, and symptoms of anemia. Malaria Rapid Diagnostic Test (RDT) being used in Kenya. RDT takes abou 20 minutes to produce a malaria diagnosis. It is useful in areas where laboratory testing is not available, it is not however foolproof. A technician looks for the malaria parasite in blood films (blood smears). Microscopic view of malaria parasites in a blood smear. Arrows point to infected red blood cells. A clinical diagnosis is based on the signs and symptoms of a disease, it is a diagnosis made without medical testing. In the case of malaria one of the main symptoms which may lead to a clinical diagnosis of malaria is a fever. Any clinical diagnosis of malaria should be confirmed by a trained professional based upon laboratory results as soon as it is possible. A Malaria rapid diagnostic test is a blood test which can confirm a diagnosis of malaria in about twenty minutes. RDTs are not fullproof and have a number of drawbacks, as such a negative rapid diagnostic test should not be accepted at face value and follow-up with malaria microscopy is necessary. To see if patients have malaria, doctors may do a blood test. This test is called a Giemsa blood smear. Blood is put on a slide which is a thin piece of glass. The Giemsa stain is put on the slide. This stain helps doctors see the malaria. Then they look at the slide under a microscope. The Plasmodium is seen in the red blood cells. People with different kinds of malaria need different medicines. The medicine that works for one kind of malaria may not for another kind. So it is very important to know which species of Plasmodium the person has. If the species is not known, the person should be given medicine and care like they have falciparum malaria – the worst kind. It is also important to know where the person got malaria. Plasmodium in some places is resistant to some medicines. So the medicines to treat malaria in Africa are different from the medicines to treat malaria from South America. Everywhere except New Guinea, the treatment is the same. In New Guinea most P. vivax is resistant to chloroquine. It can be treated with quinine, but this medicine can make people sick. Everywhere else, non-falciparum malaria is treated with chloroquine. Chloroquine kills the Plasmodium in the blood. But the Plasmodium in the liver is not killed by chloroquine. P. vivax and P. ovale both stay in the liver a long time. This is the dormant phase. Another medicine must be given with chloroquine for P. vivax and P. ovale. This is to kill the Plasmodium in the liver. The medicine used to kill malaria in the liver is primaquine. In southeast Asia, some P. vivax is resistant to primaquine. Most other places, primaquine works very well. Some people get very sick from primaquine. So people have to be tested to see if they have G6PD-deficiency before they take primaquine. Even people who are treated with medicines at home should stay with the doctor for 8 hours. This is to make sure they do not get sicker.It also makes sure they can take the medicines by mouth. Malaria does not start to become a life-threatning disease until it has been a couple of weeks after the bite without being treated. Falciparum malaria also has more resistance to medicines. This makes it much harder to treat. Falciparum malaria is always treated with two or more medicines. Doctors choose the medicines by where in the world the person got malaria. Different places have P. falciparum that is resistant to different medicines. The most important resistance is chloroquine-resistance. In some places in the world, P. falciparum is killed by chloroquine. In some places it is chloroquine-resistant. This means chloroquine does not kill it. In these places quinine can be used. Quinine is taken by mouth. Take medicine to keep from getting sick after a bite, especially in those parts of the world where people get malaria. Vector control is one way to stop malaria. Vector means an organism that carries an infectious disease to another organism. For malaria, the vector is the Anopheles mosquito. The most used method of vector control is pesticides. These are chemicals that kill the mosquito. The first pesticide used for vector control was DDT. DDT worked very well for vector control. It killed mosquitoes. It did not make people very sick at the time it was used. It did not cost very much money. Other chemicals for vector control had not been invented yet. In many places mosquitos became resistant to DDT. This meant that DDT did not work anymore in these areas. Scientists worried that DDT was making people and animals sick. It killed a lot of wildlife too. DDT also stays in the environment for a long time. For these reasons, people mostly use other chemicals for vector control. Organophosphate or carbamate pesticides are used, like malathion or bendiocarb. Vector control is not the only way to stop malaria. And DDT is not the only chemical that can be used for vector control. The best way to stop malaria is to use a combination of methods. In some places, DDT may be a useful part of a program to stop malaria. This is why DDT is still allowed to be used for controlling malaria. The mosquito that carries malaria comes more at dawn (when the sun comes up) and dusk (when the sun goes down.) Be most careful at these times. Wear long trousers and shirts with long sleeves. Wear mosquitoes repellent (this is a chemical that mosquitoes do not like, so they do not bite.) Mosquitoes will bite through thin cloth. So repellent should be used on skin and clothes. Pesticides can be used in rooms to kill mosquitoes. When sleeping outside, people use a mosquito net. This is made from cloth that air can go through but keeps mosquitoes out. It is put over a bed where people sleep to keep mosquitoes out. Sometimes people also use it when they are not sleeping. It is best to use mosquito nets that have been treated with Permethrin, which repels and kills mosquitoes. People can take medicine when they are in a place where there is malaria. This reduces the chances that they contract malaria. This is called prophylaxis. Some people take prophylactic medicines for years. Many people in areas where there is malaria do not have the money to buy this medicine. People who live where there is no malaria usually have not had malaria. The first case malaria is usually much worse. So people from places where there is no malaria may take prophylactic medicines when they go to places where there is malaria. The kind of prophylactic medicines people take depends on where they are. This is because not all medicines work on the malaria in every place. To make them work best, prophylactic medicines have to be taken the right way. The medicine should start before going to an area with malaria. Most medicines should be taken for 4 weeks after coming home. One medicine (Malarone) only needs to be used for one week after coming home. There are some children in Tanzania who are naturally immune to malaria. Researchers are using this to develop a new vaccine. U.S. researchers have found the children produce an antibody which attacks the malaria-causing parasite. Injecting a form of this antibody into mice protected the animals from the disease. The researchers plan to do tests on primates, including humans. World War Two era poster. It was Britain's Sir Ronald Ross, working in the Presidency General Hospital in Calcutta, who finally proved in 1898 that malaria is transmitted by mosquitoes. He did this by showing that certain mosquito species transmit malaria to birds. He isolated malaria parasites from the salivary glands of mosquitoes that had fed on infected birds. For this work, Ross received the 1902 Nobel Prize in Medicine. After resigning from the Indian Medical Service, Ross worked at the newly established Liverpool School of Tropical Medicine and directed malaria-control efforts in Egypt, Panama, Greece and Mauritius. The findings of Finlay and Ross were later confirmed by a medical board headed by Walter Reed in 1900. Its recommendations were used during construction of the Panama Canal. This public-health work saved the lives of thousands of workers and helped develop the methods used in future public-health campaigns against the disease. The first effective treatment for malaria came from the bark of cinchona tree, which contains quinine. This tree grows on the slopes of the Andes, mainly in Peru. The indigenous peoples of Peru made a tincture of cinchona to control malaria. The Jesuits noted the efficacy of the practice and introduced the treatment to Europe during the 1640s, where it was rapidly accepted. It was not until 1820 that the active ingredient, quinine, was extracted from the bark, isolated and named by French chemists. In the early 20th century, before antibiotics became available, Julius Wagner-Jauregg discovered that patients with syphilis could be treated by intentionally infecting them with malaria. The resulting fever would kill the syphilis spirochaetes, and quinine could be administered to control the malaria. Although some patients died from malaria, this was preferable to the almost-certain death from syphilis. Malaria was the largest hazard encountered by U.S. troops in the South Pacific during World War II, where about 500,000 men were infected. Sixty thousand American soldiers died of malaria during the North African and South Pacific campaigns. ↑ Saliva is moisture, or spit, made in the mouth. ↑ "Biography of Ronald Ross". The Nobel Foundation. http://nobelprize.org/nobel_prizes/medicine/laureates/1902/ross-bio.html. Retrieved 2007-06-15. ↑ "Ross and the discovery that mosquitoes transmit malaria parasites". CDC Malaria website. Archived from the original on June 2, 2007. http://web.archive.org/web/20070602185153/http://www.cdc.gov/malaria/history/ross.htm. Retrieved 2007-06-15. ↑ Kaufman T, Rúveda E (2005). "The quest for quinine: those who won the battles and those who won the war". Angew Chem Int Ed Engl 44 (6): 854–85. doi:10.1002/anie.200400663 . PMID 15669029 . ↑ Kyle R, Shampe M (1974). "Discoverers of quinine". JAMA 229 (4): e320. doi:10.1001/jama.229.4.462 . PMID 4600403 . ↑ Raju T (2006). "Hot brains: manipulating body heat to save the brain". Pediatrics 117 (2): e320–1. doi:10.1542/peds.2005-1934 . PMID 16452338 . http://pediatrics.aappublications.org/cgi/content/full/117/2/e320. This page was last changed on 23 May 2014, at 07:37.